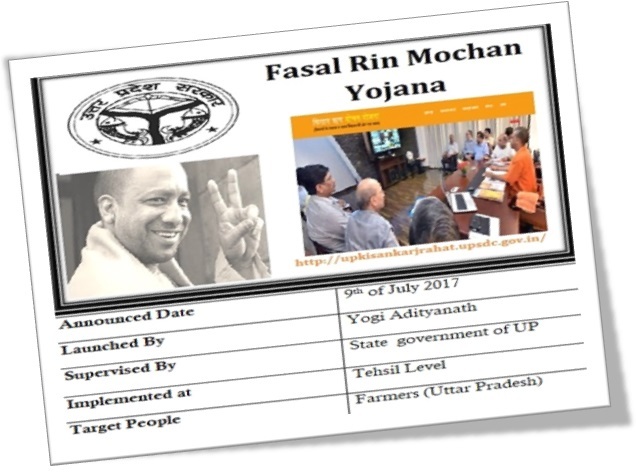 The Uttar Pradesh Chief Minister Shree Yogi Adityanath has officially launched the Fasal Rin Mochan Yojana back in July 2017. Under this scheme nearly 86 Lac farmers will get freed from the crop loan they have taken. This is the first scheme that Yogi launched after being the CM of UP. Citizen : The farmers must be the residents of Uttar Pradesh. Also the farmers’ lands on which the loan is taken must be within the UP state premise. Anyone or any land beyond the UP border will not be considered under this scheme. Farmers who have taken loan before 31 March, 16 will only be eligible for the scheme. Farmers who have taken any type of crop loan after the mentioned date will not be eligible. Loan Limit : The loan amount must not be more than Rs. 1 Lac in total. Those who have taken more than Rs. 1 Lac as loan will not be eligible for registering under the scheme. Land Size Limit : A farmer should be an owner of the piece of the land which size should be below 2 Hectares. The fasal rin mochan yojana is the first official scheme launched by the new CM of UP. After coming to the power Yogi announced this scheme as per the promise he made during election promotion. The yojana will have online portal thorough which farmers can apply for the loan waiving facility. If the farmers pass through the eligibility criteria they can register for the scheme thorough online. The implementation of the scheme will be district-wise. In a recent meeting held with CM and district magistrate it has been decided that there will be control offices in each Tehsil across each district. Through these control rooms scheme will be implemented. According to the rule, by 17th of August all the farmers will get the loan waiver. There should not be any problem or obstacle while doing so. There will be a helpline available for the farmers. They can directly call on these numbers and can talk about any issues or problems they face in farming or loan related issues. There are two main documents are needed for the scheme. The first document is Aadhaar card which is a mandatory one and the second document is land papers of the farmers. Also the bank account number and details will be needed for the scheme. Aadhar card is mandatory in this scheme because it will be linked to the bank account of the farmers. Those who don’t have aadhar card but holds a bank account will be given special provision to get their aadhar. According to the rule of the scheme the district magistrate will provide an office in the Tehsils for enrolling people who don’t have aadhar. This facility will be free and no service or any other types of money will be collected for this. On 15th July, Saturday the aadhar enrolment process has taken place. To register for the scheme one has to click on their official website https://www.upkisankarjrahat.upsdc.gov.in/. There you will get the ‘login’ button. If the farmer is already a member of the website then can directly login with the ID and password. If the farmer isn’t a member then he has to sign up with his information with the website. After signing up he can fill up the registration form for the scheme available on the website. In that form one has to give the required information such as name, age, contact details, bank account, aadhar number and also land and loan details. Finally submit the form after verifying all the information given. The verification and other process will take place later. By 17th of August all the beneficiary will be selected and provided the loan waiver by that time. If you want to check loan status click here. In order to officially register complaint under the Kisan Karz Rahat scheme the applicant has to first get started with visiting the official web portal at upkisankarjrahat.upsdc.gov.in. On the redirected web page the applicants will first have to create their Log in ID by providing necessary information. You can also direct reach the log in page by clicking the link at http://upkisankarjrahat.upsdc.gov.in/Login.aspx. To register the complaint the applicant will have to make a selection of the “Register complaint” option from the web page. The option is available on the web portal or can be directly reached by clicking http://upkisankarjrahat.upsdc.gov.in/complaint.html. 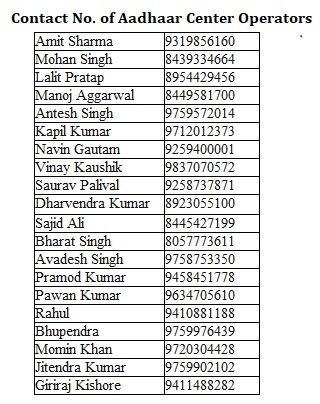 In case you want to register a new complaint you have to again make the selection of “Register complaint” option provided or make the selection by clicking the link at http://www.upkisankarjrahat.upsdc.gov.in/complaintpublic/Application_NONNPA.aspx. On the redirected web page applicants are expected to provide with their valid registered mobile phone number. Once entered you shall be forwarded with an OTP that has to be entered on the desired tab. Once done you just have to submit the form. Any applicant who wishes to check with the status of the registered complaint at the Fasal Rin Mochan Yojana will have to select the “Check status” option for registered complaint. You can also select reaching the web page directly at http://www.upkisankarjrahat.upsdc.gov.in/complaintpublic/ComplaintStatus.aspx. Now on the redirected web page you have to provide with details related to your valid registered complaint number along with your registered mobile phone number. Once the details have been provided you have to select the submit option. You will be provided with complete details related to the status of the registered complaint on the screen. These numbers will be activated soon to help the farmers. They are toll free numbers and any kind of problems regarding loan waiving scheme can be solved through these mentioned numbers. आवंटन की तारीख क्या होगी ? Rs. 29, 771 Cr has been allocated for Agriculture in the last budget by central government. Within that amount nearly Rs. 19, 000 Cr has been allocated to enhance the crop yielding and better farming. The loan waiving scheme aka Fasal Rin Mochan Scheme will be part of crop yielding and better farming. At this moment no exact amount is released as the budget for the scheme. By initiating the Kisan Rin Mochan Yojana, the Government of Uttar Pradesh has decided to forgive the NPA loan of the farmers. The scheme is effective for the farmers who have submitted their respective applicants for the Kisan Loan Redemption Scheme. Previously it was reported that the scheme would be hugely beneficial for the farmers to reduce their crop loan. With the latest news, it has been said that the 12 thousand people who submitted their complaint through the online portal will receive the waving of their loan shortly. The government recently has made a list of about 7,000 farmers, whose verification is still under process. These farmers will get the benefit of the Kisan Rin Mochan Yojana soon.